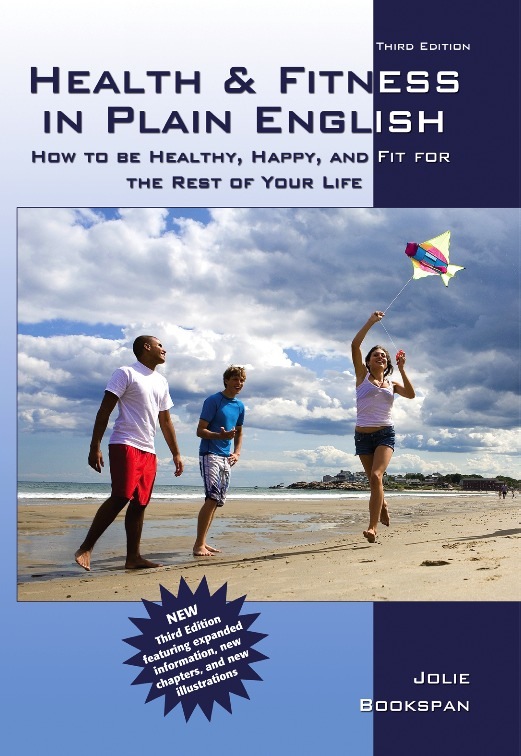 Welcome to Fix Your Back Pain - on my large free web site DrBookspan.com. I am a researcher and clinician in human physiology and performance in extreme environments. I study why common training and pain rehab methods don't work and what works better. I develop evidence-based sports medicine methods that you can use yourself, right away, to fix your back pain, neck pain, knee pain, other injuries, learn smarter stretches, and make your life stronger, faster, smarter, healthier, and sometimes funnier. I make my web site available for a better world. This page shows you how to spot and stop several causes of lower back pain. Then the pain stops and your back can heal. This is different from doing exercises or taking medicines and supplements, while continuing to cause the same pain. You don't need to stop activity. With healthy movement, you can do more than before. Lower back pain can be easy to fix. This is a Get-Started-Right-Now summary, with a wealth of knowledge still to give. Read my books for more. Hope I will get to meet you in my CLASSES or over a personal online consult, maybe in a rare in-person Private Appointment. If you want more about me, check my page of Adventure Medicine. Have fun. Not All Exercise Is Good Medicine. It's not health care if it's not healthy. Much cost, time, and worry currently spent in medical treatments and common therapies and posture rules and devices are unnecessary and often unhealthful. 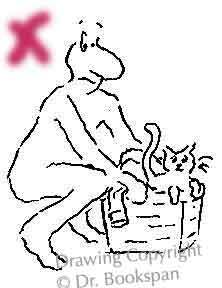 I spent years in the lab researching and checking methods - evidence-based, primary source research - and put the results here on my web site as a public service for the benefit of the world. Get better and the world will be better. My work is not "alternative medicine." This is evidence-based sports medicine techniques, applied to real life - where you actually need it. I consider it simple, common sense, standard of care. Surgery, shots, extended medical treatments, and bed rest have not been shown to be a healthy effective way to relieve back pain. You can fix most pain without them. You do not need to give up impact activities like running or martial arts, give up weights or heavy occupational work, or activities you love to do. Not all exercise is healthy, just like not all foods - some are junk. This article shows you how to change your movement habits to healthy ones, You will get the built in exercise you need for health while you prevent the causes of most back pain. This is different from doing sets and reps of exercises, then going back to injurious daily habits. Back muscle pain, discs that degenerate bulge or herniate, facet injury, narrowing, and most joint injury are not the cause of the problem - they are the RESULT of what you are doing to hurt your back - things you can fix yourself. Even when inflammation or immune response are identified, they are results, not causes. This article will show you how to understand and fix causes, instead of using drugs and surgery for the results. You may have several causes of pain. If you fix only some of them, you will fix only some of your pain. The answer is not to continue on, missing the rest, saying "it just takes time." Don't allow the other damaging causes to continue. Check for other causes you may have missed and fix them all. Then you will stop all pain, and instead of alternating feeling better from fixing one thing and hurting from other causes, wondering why you have intermittent results, you fix all and heal all and get back to your life stronger and better than before. You do not need special chairs, beds, devices, or gimmicks to "put you" into any specific posture or position. Many common medicines and prescription drugs can cause back and body pain. Several popular exercises often worsen pain or cause it in the first place, including certain hamstring stretches and ab exercises. Many commercial chair posture-changing devices and foot orthotics produce more pain and are not needed in the first place. 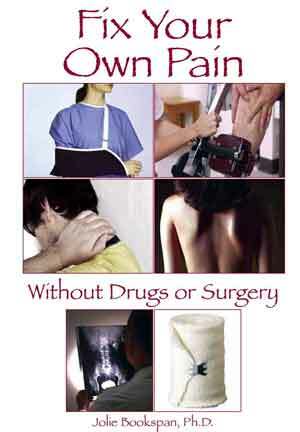 Un-needed treatments and surgeries are done - causing more pain and reduction in physical ability. Easy changes can stop the need for harmful medicines. Study of posture rules, exercises, and devices has shown they have made as much or more pain and damage as slouching, and do not create healthy movement. They are also no fun. First, healthy lengths during movement needs to be learned. Then all daily movement builds-in healthy comfortable fun habit. This article summarizes all the above. Make sure you understand the concepts (many highlighted in green). This is not posture (a static rigid concept to most), but functional body mechanics, good ergonomics, healthy movement mechanics, functional movement. The end of this article (where it says "More fun...") gives many helpful links to pages on this site for more help. The Bottom of every page on my web site gives main navigation links. If you have lower back pain from long standing, walking, and running, and you feel better to sit or lean over, especially if you hurt more to lie flat face up or down, start with my separate article to fix standing pain, then come back here for the rest. If you have back pain from several causes including facet, you can start here, then go to the fix standing pain article. Matt had severe disc injury. Several doctor opinions were for surgery. Shortly after working with me in Spring 2015, he went back to hiking, climbing and skiing, more about this at the end of this article. A year and a half later, he wrote me, "I spent a month skiing last winter in Montana and another month hiking and exploring in Colorado and Arizona last summer. I did everything from ski knee deep powder to hiking a 14,000 ft mountain. I'm so happy I found you and your information and never got surgery." Studies and news reports state that back pain is mysterious and difficult to remedy, but back pain does not have to be difficult to fix or prevent. The answer is simple. People do an astonishing number of things every day to do ordinary activities with injurious movement habits. They bend wrong hundreds of times every day. They do exercise with the same poor body mechanics. They stand, bend, sit, and lift wrong every day, hold muscles tightly while they move around, then do bad exercises that add to the strain. People wonder why they still get pain even though they "do their exercises." They do "back exercises," but do not know that strong muscles will not automatically give you healthy posture, make you bend and lift properly, or make up for all the things you do the rest of the day to injure your back. Back pain treatments are done by the hundreds of thousands daily: physical therapy, surgery, exercise, massage, pain management, chiropractic, acupuncture. Pain may reduce at the time, as almost any movement makes you feel briefly better, or the treatments are done lying down in positions where most people would feel better anyway. Pain returns if you have not stopped the cause. Many wind up in back surgery, or long term or recurring pain, not understanding why their physical therapy or exercise program, or pills, or yoga "didn't work." They call it "stress." Instead, it is simple to retrain unhealthful movement and habits. Stop the cause of the injury and the pain will stop. Instead of doing a bunch of artificial rehab exercises, and using stiff, uncomfortable posture drills, then going back to damaging daily life movement, I have developed functional health and exercise movement mechanics for living and moving in healthy ways. "Hello Dr Jolie, Hope this email finds you in best of your health, It has been a long time since I have written to you. I have been doing really good with my back by doing just the basic things that you had suggested and advised. So am really thankful for that." If you have disc pain or sciatica, the following are a few things to start. 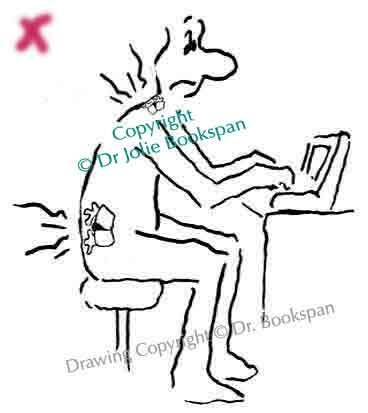 Then use the full FIX DISC Pain and Sciatica page. You know you shouldn't bend wrong, But you do  all day, every day  picking up socks, petting the dog, for laundry, trash, making the bed, looking in the refrigerator, and all the dozens of times you bend over things. Then you go to the gym and lift weights bent over, stretch by touching your toes, do yoga with repeated forward bends, then lift and carry bags like that. No wonder your back eventually accrues damage and injury. Years of bent forward sitting and standing, and bad lifting and stretching where you stand or sit and lean forward, are enough to injure your back over time as badly as a single accident. After years of pushing discs outward with unhealthy bending and forward rounding, the discs can eventually break down (degenerate) and push outward (herniate). The resulting herniation can press on nearby nerves, sending sciatic pain down your leg. If you squash and push the discs in your neck with a forward head posture - letting your head drop forward, and/or constantly holding your chin forward and up, the disc(s) in your neck may herniate and press on nerves, sending pain down your arm. Shoulder stands and yoga plows are becoming more known as common sources of herniation and bone spur. Chronic forward bending (flexion) sheers and pushes vertebral discs outward, and overstretches the muscles and long ligament down the back, allowing more room for discs to protrude centrally instead of more to the side. Tight muscles from years of poor positioning and short resting muscle length can also press on the same nerves mimicking sciatica. A degenerating disc is not a disease, but a simple, mechanical injury that can quickly heal, if you stop grinding it and physically pushing it out of place with unhealthy habits. This is a side view of your spine. Left - normal disc between two vertebrae. Right - disc pushed out (herniated) from bad bending habits. Chronic forward bending from bad sitting and bad bending over sheers the discs and gradually pushes them outward. Instead of damaging yourself all day, many times a day, stop the damage, and the pain stops with it. Then your injuries can heal. Good bending also gives you built in strength and stretch that further helps fix pain and gives better overall health built in to your ordinary day, without exercises needed. Done right good bending will not hurt your knees and can be used to strengthen and prevent knee pain as well. Other things to do also follow below in this article. More specifics about discs are in the Fixing Discs article. If your pain is mostly when standing and goes away with sitting, then you may be standing with swayback and can fix that easily with information in the article to Fix Back Pain Felt When Standing. 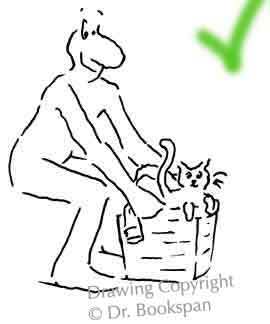 It is still healthy and important to fix bad bending and sitting habits, as above, also. Back pain has a large component of bad movement mechanics, not weak muscles. Strength does not make you bend or move in healthy ways. Many people do strengthening exercises and become stronger people who still bend wrong, move wrong, and slouch. "Core" exercises are especially misunderstood and repeated and prescribed without any understanding that stronger abdominal muscles have little to do with the most common causes of back pain. Moreover, most conventional core training exercises are done in bent forward ways that reinforce the same bad mechanics you started with. For the research and interesting story on what abdominal muscles really have to do with back pain, see my article on Abdominal Muscles - what they do may surprise you. 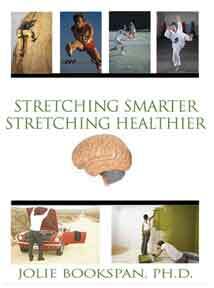 Bending, standing, moving, and living your life with healthy movement mechanics is up to you. The rest of this article tells more on how. Where strengthening helps - Someone may use good body mechanics all day, yet ache with fatigue at the end of the day. That is not a back injury or true back pain that needs treatments, and should not be addressed with medications. Another instance is someone who really is so weak that they can't hold up their own body weight and instead, shifts it onto their joints, which wear with time and grind under the weight (slouching). A little strengthening allows you to do more before fatigue pain sets in, and to be more able to use good mechanics instead of slouching. Strengthening will not keep you from slouching, and don't fall prey to unhealthful exercise programs claiming to cure back pain. Almost any movement can make you feel better for the moment. Over the long run, it's better not to use injurious movement techniques for your health. Use good mechanics for all you do and healthier ways to exercise explained in this article, other free articles on this site and the books with more. "Dear Dr Jolie, Your approach is great! Bought two of your books and the more I read and understand, the more I wonder why your common sense approach was not discovered before. Why exercise and at the same time make no change in our poor daily habits? That does not work at all. God bless you !" - Marie vB. Disc injury is not a life sentence. Disc degeneration or slippage (herniation) can heal - if you let it, no differently than a sprained ankle. Stop damaging your discs with bad bending, standing, and sitting habits and the discs can heal. It takes years to herniate a disc, and only days or weeks to heal it by stopping bad habits. Several things contribute to disc pain. Read the rest of this article, try everything that makes sense to you and doesn't hurt, then go to the free article on Fixing Your Own Discs and Sciatica. Certain pop fitness and PT exercises say to tighten or brace or draw in abdominal muscles, squeeze together shoulder blades or gluteal or other muscles. It is not a useful or healthy or effective practice. Tighten your neck! Sound comfortable? Tighten your legs and walk around or go running! Sound sensible? When you bend your arm to scratch your nose, you don't tighten your arm muscles to do it. In fact, you shouldn't want to. You merely move your arm bones using your arm muscles. Healthy movement is the same. No squeezing should be needed. Strengthening and movement does not need tightening. Much of the tightening or squeezing (or whatever other word you use for this unfortunate habit) is often a cause of pain and bad movement habits. When you chronically over-tighten muscles with hunching forward, overarching backward, and bad habits and beliefs about tightening, they can remain too shortened to let you stand properly. Or they stay tightened in knots or spasm. This changes their muscle chemistry. Stop using bad movement mechanics and your causes of pain can stop. More about spasm, below. Back pain exercises are misunderstood. Are you injuring your their back all day then hope to fix it with a few exercises? This does not work. When you stop bending wrong many times each day, which injures your back many times each day, it will stop hurting and can heal. If you lie on the floor to do exercises, then stand up and walk away with no use of the positioning or strength you just practiced, it is like eating butter and sugar all day, then doing 10 minutes of exercises and wondering why it doesn't "work." The key is what you do all day. You know not to bend over to pick things up, but you do it. Every day. Hundreds of times a day. Instead, when you crouch for things, keep your body mostly upright. You already know that. But do you do it? Are you avoiding it because your legs are too weak, or it hurts your knees? Done right, it will prevent both back pain and knee pain. The key is knee positioning to keep body weight on the muscles of the thigh and hip, not on the knee joint. Press more from your heel not the front of the foot. Practice bending knees without bringing them forward. Keep knees over the foot. It takes a little more muscles use to bend right, but good bending will give you the increased strength you need, built-in to every time you bend and crouch. See the separate KNEE PAIN article for more about knees. Use a healthy squat (right) for all the many times a day you bend. Keep heels down. Bring knees back, not forward. Good bending (right) does not hurt knees, strengthens in healthful ways, and prevents bad mechanics that are a common source of back pain. Stand comfortably with feet side by side. Feet are any width apart, because this is real life. You need to bend in many different sizes and kinds of places and situations. Your upper body stays mostly upright, not tilting far forward. Keep both heels down on the floor. Don't lift your heels. Keep weight back over the entire foot, rather than forward to the ball of the foot or toes. Both knees stay back toward your ankles, not sliding forward. Good bending saves your back, strengthens knees, and prevents knee pain at the same time. Do not keep a large inward curve to the lower back. That was a fad in past years. It was never healthy or good biomechanics. It was an exaggerated curve and caused many problems of its own. 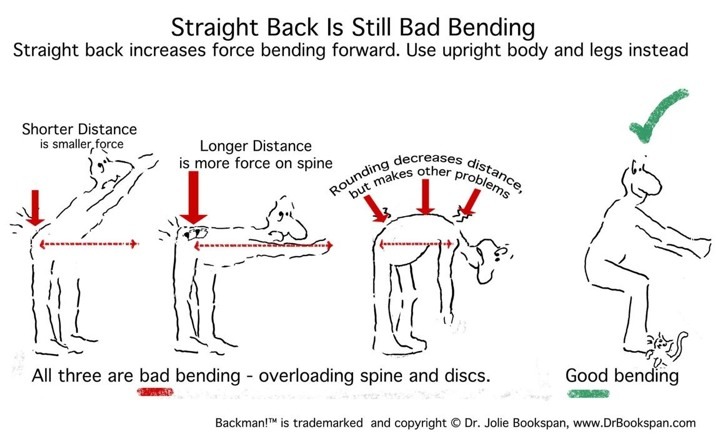 More about neutral spine and why this overarching is another major contributor to another kind of back pain is summarized below, and in full in the article "Back Pain With Long Standing and Running - What Abs Do, You May Be Surprised"
Good bending gives good lengthening of the lower spine. Good bending with a healthy squat is a superior lower back stretch compared to bending over forward to touch toes. More on that follows. Is it not an exercise that you do 10 times a day. It does not fix anything if you do it as an exercise. You use it as healthy bending instead of bad bending for all the hundreds of times in every day that you crouch and bend and reach down for things. Then you do not move in a way that injures and hurts. The squat is completely misused when it is given as an exercise to do 10 times a day to strengthen, then return to bad bending after. Using good bending throughout the day gives a healthy "moving stretch." It is highly effective as a stretch and movement re-trainer. 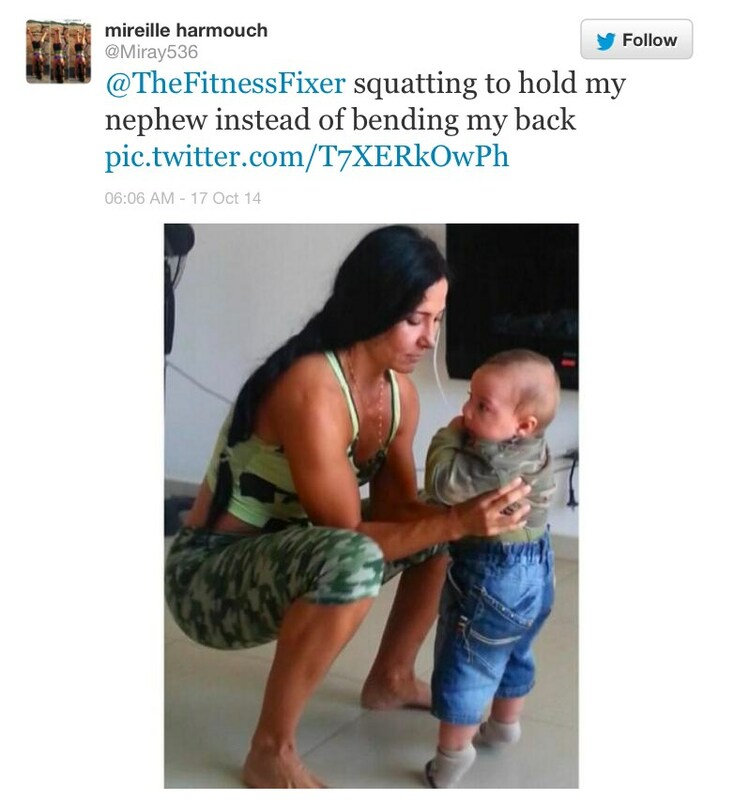 It is better than rigidly holdIng static stretches, or doing slow squats as reps of rehab or gym exercises. Real bending using a healthy squat for the things you need to do every day makes effective warm-ups and can loosen tight hip areas, all built-in to your real life. "Fitness" people love to debate how deep to squat, and exactly what joint angle to hold your body, and ignore real life - dozens, even hundreds of "good bends" needed of various heights and foot placements to reach and retrieve things every day. Stop hurting your spine and muscles with bad bending and your back will stop hurting. Start strengthening your body and legs with good bending and you will get free exercise all day. Another way to bend well (left) for all the many dozens of times you bend every day is a lunge. Keep front knee over ankle (left) not forward (right). Width of feet depends on what you need to reach and your surroundings. Use this for real movement. Stand comfortably with one foot in front, the other comfortably back, any width apart that you want to practice with. Keep the back foot facing straight forward, not turned out. Tuck your pelvis and hip under to reduce your lower back inward curve to a smaller curve. More neutral spine with smaller curve will stretch the front of the hip IN THE REAR LEG. If you do not feel the front of the hip in the rear leg getting nice stretch then you are doing it wrong. More about neutral spine follows below. A lot more information about it a is on the "Fixing Swayback" page. Bend both knees to dip towards the floor as far as comfortable, without touching the floor. At least dip down a few inches. Don't let your front knee slide forward. Keep your front knee over the ankle. This is an important part of using the lunge to save your back - you shouldn't hurt your knee. Done properly, the lunge strengthens and protects your knees too. Is it not an exercise that you do 10 times a day. It does not fix anything if you do it as an exercise. You use it for all the hundreds of times you bend and reach down in a day instead of bad bending. Real lunges (healthy crouching) to pick things up around the house and workplace becomes a highly effective"moving stretch" and movement re-trainer, better than stiff slow lunges as gym or PT exercises. Stop hurting your back with bad bending and your back will stop hurting. Start strengthening your body and legs with good bending and you will get free exercise all day. Unless you are moving in healthy ways for your real life, it is not a lifestyle and it is not healthy. Healthy bending, sitting, reaching, sitting, standing, and moving is easy and life changing. It is free exercise and injury prevention. When should you do it? Each time you want your daily life to be healthy. "Dear Dr Bookspan, Please add my name to the list of happy people with happy backs! I've been doing stretches and bends as you have instructed and my lower back and hips are delighted!! I know how much stronger and what better form I have when I go to work on my own clients and am not hurting during or after. Many thanks, Marianne"
Most people know that rounding your back a lot is unhealthy. Armed with that, they leap to the idea that the opposite will automatically prevent all problems. It doesn't. Bending forward with a straight back adds to load directly on the lower spine. Straightening an overly rounded spine does good things - when you are sitting or standing upright. 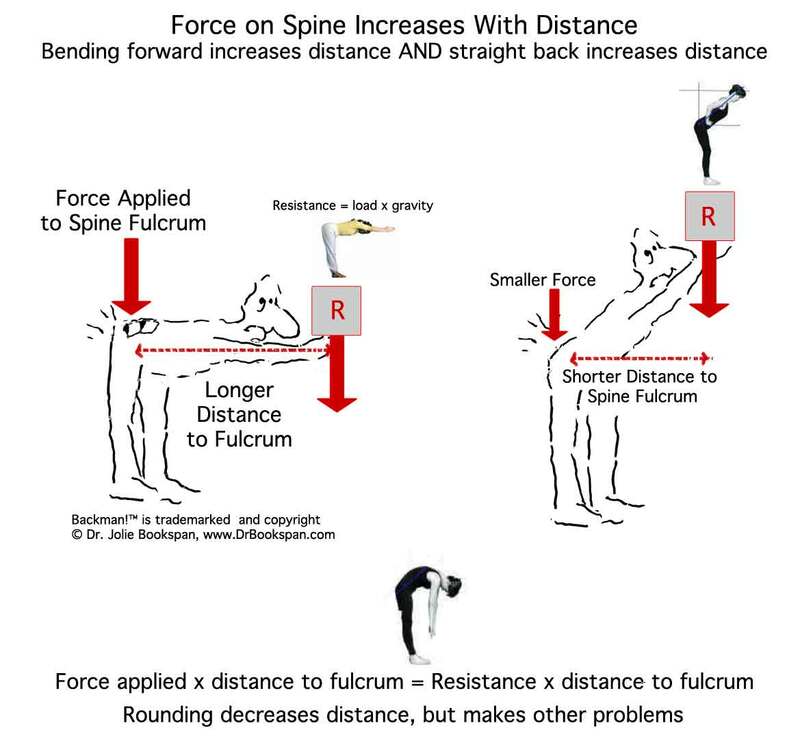 However, when you bend forward, either rounded or straight - both increase injurious leverage on the lower spine. Leaning forward with a straight back increases the force up until reaching maximum at a horizontal position - the hip hinge position. As a separate problem, the common practice of "rolling up one vertebra at a time" causes the separate problems of unequal pressure on discs. There are no hip hinges that are good for discs. Please mentally adjust the hip hinge drawing (second from left) to include the several variations of hip hinges. Use the CONCEPTS, please, and use healthier ways of moving and bending. Thank you Extensionyoga.com for the instructive yoga figures in black. Use good bending with the half squat, shown above, instead of bad bent-forward bending, which is one of the major contributors to lower back pain. The upper body stays fairly upright, and the upper spine does not round or hunch. There is no exaggerated inward curve to the lower spine, which was a fad in fitness gyms for a decade or so. More about all the back pain that fad caused is in the Hyperlordosis and Abs article. Good bending, as shown above, gives a daily, natural, built-in stretch to the Achilles tendons, calf, hips, and lower spine. 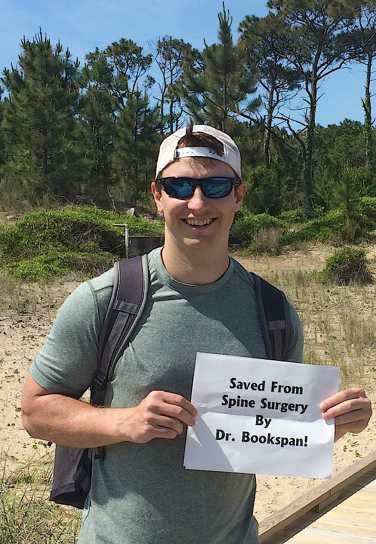 "Thank you Dr. Bookspan. I hurt for 30 years and now I don't. I can't believe in all my years, no other doctor has ever mentioned this type of treatment. Thank you so much!" What if You Want a Hamstring Stretch? There is no need to bend over forward to stretch the hamstrings. There are better, more functional ways to stretch them, shown in #5 below and also on my Stretching Smarter page with more in my Stretching Smarter book. "Functional" means that you stretch them in the way you need for real life hamstring range of movement, not by bending over. I did studies that found no relation between hamstring flexibility and lower back pain - click the Hamstring Page to see why it is so often mistakenly prescribed for back pain. I put more about understanding and using yoga moves for health on the syllabus page for my yoga classes. Many moves are traditional, but unhealthful. Click the Yoga Syllabus here or from my Class page. Remember - yoga, not dogma. If you have lower back pain during or after walking, running, backpacking, and feel you need to lean or bend over forward or lift one leg to stop the pain, this kind of pain is usually from allowing too much inward curve in the lower back. Summary follows below. Read the full article here to understand why and know how to spot and fix this common hidden source of ongoing back pain that seems to come with standing and relieved with sitting or lying down or bending over. Standing with too much inward curve of your lower back is called swayback and hyperlordosis. "Hyper" means too much and "lordosis" is the lumbar inward curve. Sometimes people say "lordosis" to mean too much curve too. Then confusion comes when people use the two different words to mean the same thing. I will use "hyperlordosis" or swayback to distinguish. Hyperlordosis (overarching) is a major cause of "mystery" back pain and injury. Hyperlordosis is not a structural problem. It is a slouch; a bad posture. You create hyperlordotic posture in two main ways. Drawings above show two of several ways of overarching the lower back (hyperlordosis, also called swayback). Left - tilting pelvis and leaning upper body backward. Right - level pelvis but pushed forward and leaning the upper body backward . Swayback compresses the lower spine. Pain is usually noticed after standing, walking, or running.Stop pain with neutral spine, explained in the Fix Hyperlordosis article. No strengthening exercise will do it for you. It is a voluntary, deliberate change in how you stand and move. 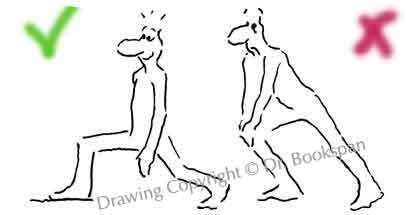 Hyperlordosis, also called swayback, is an increased inward lower back curve (arch). Also calledswayback or too much lumbar arch or too much lumbar inward curve. Swayback compresses the joints of your spine, called facets, and surrounding soft tissue. The weight of your upper body slouching onto your lower spine creating a feeling of ache, pinch, and or pressure. The ache goes away immediately in many cases when you reduce the large curve - as often occurs when sitting or lifting a leg or lying with knees bent. These are not cures and are often mistaken for things to do, instead of obvious diagnostic markers. Another hidden way that overarching (swayback/ hyperlordosis) hurts is when an existing bulging disc becomes squeezed by the spine bones as they angle toward each other in bad positioning. Hyperlordosis is not a medical or structural condition. Hyperlordosis is a posture you can control by using torso muscles to move your spine away from the arched position into a straighter healthier position, described below and in the free Fix Hyperlordosis (abs) article. Hyperlordosis of Pregnancy is the same preventable bad posture. It is leaning backward to offset a load in front. Leaning backward from the lower back makes a sharper inward curve, pinching and compressing the lower spine, making the area ache after long standing. Neutral spine is a voluntary, deliberate change in how you stand and move. No strengthening exercise or posture drills or core training will do it for you. Fix it with the neutral spine positioning shown in summary below and in detail in the Fix Hyperlordosis article. If you get lower back/ hip/ flank pain during and after long standing, running and overhead lifting, a common cause is standing with the lower back overly folded and tilted back so that it pinches and compresses the joints and soft tissue. People who stand with this poor position usually feel they must bend forward or sit to relieve the ache. Stretching, ab exercises, and all kinds of crazy gimmicks became confused as cures, instead of not standing wrong in the first place. The left (first) drawing above shows neutral. The second shows tilting the pelvis forward (the backside tilts outward in back). The third shows a level pelvis, but hyperlordosis from leaning the upper body backward. I spent many years identifying these (hopefully now obvious) painful positions. 1. Stand with your heels, backside, upper back against a wall. Notice how much curve is in your lower spine and how far that inward lumbar curve is away from the wall. 2. Press the lower back area closer toward wall. The large space between your back and the wall becomes a smaller space. No need to completely flatten against the wall.Just use it to learn the movement needed to reduce the large curve to a smaller one. Belt line becomes horizontal from front to back. Back pain from overarching should stop right then, if you do this right. Make sure you can relax and breathe and feel that this is a motion of your spine, without any tightening of your abdominal muscles or your gluteal muscles. 3. When you walk away from the wall, use this new neutral spine position all the time as a relaxed healthy position. A short gif should appear below of one of my students, David of Belgium. He starts with overarched lower spine, mostly from the tilted pelvis, then shows reducing the overarch (hyperlordosis) to neutral spine by moving the pelvis to vertical. Note: Watch the lower spine reduce in inward curve. The pelvis changes from tilted to vertical. Do not push the pelvis forward of the midline. The knees (off camera) do not bend. Practice so you can move your spine without needing to bend the knees. Use your own muscles to reposition your spine, no matter what else you are doing. Dont lean your upper body back when carrying things in front of you (anterior loads) like a chair, grocery bags, a pet, or baby. Dont lean back when lifting or reaching overhead. Dont let bags or loads pull your posture away from healthy position. Use your muscles for comfortable healthy pain free positioning. Crunches and ab exercises do not change swayback, or fix the cause of this kind of back pain. How you stand and move all day is what determines if you are putting your lower back into a position that folds it so that your lower back hurts. My abdominal article tells more of this method, with more GIFs. 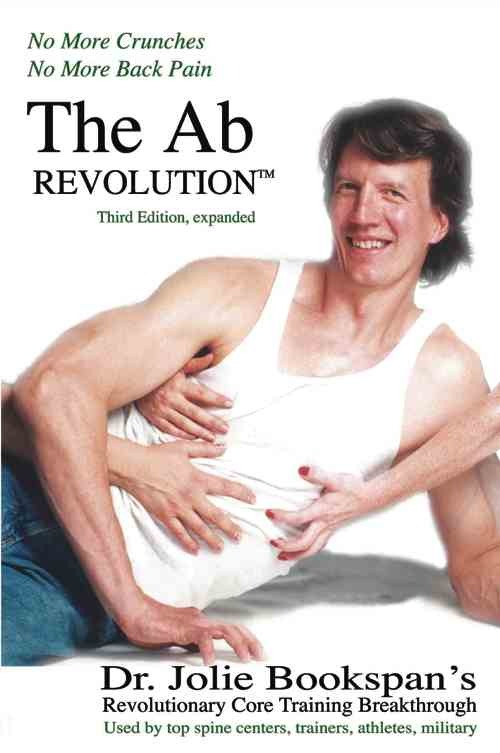 My book The Ab Revolution teaches several ways to learn to fix swayback (to reposition your torso, hip, and lower spine) and how to use the repositioning for all you do in daily life and for healthier more effective exercise. Aren't You Supposed To Overarch The Spine, Tilt The Pelvis, and Stick Out Your Backside? A small inward curve belongs in the lower back. Unfortunately, people hear that, and overdo. Overarching is not the normal curve to the lower back, it is not neutral spine, and it is not the way to protect your back when lifting or exercising. An injurious phenomenon in fitness and "health" magazines is to stand and exercise with the hip and behind tilted out in back, and the lower back overly arched. It is not attractive because it is not healthy. It is sloppy posture, unhealthy for the lower spine, and shows a lack of understanding of how to use core muscles to hold neutral spine. Overly-arched posture is promoted by popular fitness personalities, and popular exercises, where it is mistaken for, even advertised for, fitness and trimness. Trainers often tell clients to stick their behind out when squatting or lunging, however this is too much arch. The hyperextension is damaging to the low spine joints and soft tissue. It also does not use core muscles effectively. What Do Abs Have To Do With This? Abs work like any other muscles - they bend the joints they cross. For example. biceps bend your elbow forward (or keep it from straightening). Abs cross your vertebrae. They bend your spine forward or keep it from swaying backward, but only if you voluntarily use them. Using abdominal muscles does not mean to tighten them. TIght muscles can't do their job. You wouldn't want to tighten your leg muscles and try to run. Or tighten your throat and try to sing. You use abdominal muscles to move your spine. That's all. You need to deliberately use your abs while standing to hold you from backward arching, particularly when reaching overhead and carrying loads. Using your abs doesn't mean sucking them in or making them "tight. You can't breathe or move properly with tightened muscles. Tightening does not change your posture or reduce the pain-producing arch. How Do Abs Help Your Back? Using your abs means voluntarily moving your spine away from overly-arched position, and into neutral spine when standing. It is not a matter of having strong abs. A slightly-built person can stand with neutral spine, and muscular people can have overly-arched spine posture. It is a matter of using abdominal muscles to prevent the overarching that causes pain. My book The Ab Revolution teaches this concept and shows how to use it during all daily life and exercise movement. Doesnt Doing Crunches Help That? It is not strength that makes you stand correctly. It's how you hold your own posture. Many muscular people stand with terrible posture and have back pain. Crunches don't work your abs the way you need for real life. Crunches don't train you how to use your abdominal muscles and core the rest of the day to control your spine position. They don't do it automatically. Crunches reinforce rounded flexed posture, even when done properly. Crunches make a person, who likely spends much of their day already hunched over a work area, practice that hunched posture which may be mechanically promoting the back and neck pain they think they are working their abs to prevent. Most people do their crunches then stand up arched with no knowledge that back support comes from voluntary posture, not automatic strengthening. A common ineffective exercise often given for back pain is to lie on the floor or stand, and tilt (tuck) the hip and pelvis 10 times (or any number of "reps"). The claim is that these minor motions strengthen the area, with the further untrue claim that strengthening will stop the pain. 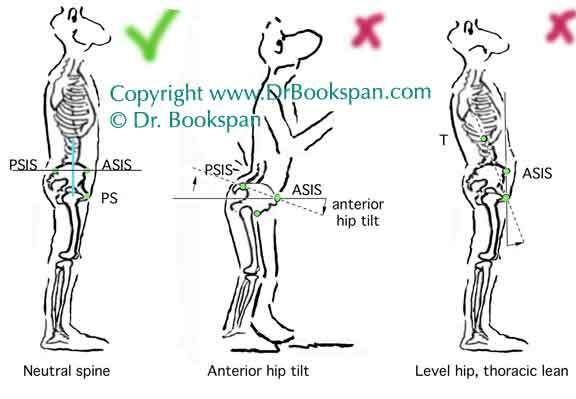 Any exercise from pelvic tilts is miniscule, and pain is not from weakness. Often, the person finishes their pelvic tilts, then stands and returns to the same swayback (slouch) that causes the pain. Pain returns. It is no mystery. The purpose of the pelvic tilt "exercise" is to practice how to move your spine and pelvis out of the overly arched position that causes pain, into healthy neutral spine (tucked just enough to be neutral). Then you must *use* that neutral position (that you just practiced) for all your standing movement.No tightening or strengthening is involved. Tilts do not strengthen. The movement is too minor and low resistance. Even if tilts strengthened, back "support" is not automatic. Strengthening any muscles will not a bad posture which causes pain. Stronger muscles do not automatically move any body part anywhere. You have to move yourself into desired posture. The use of pelvic tilts is to retrain how to reduce your lower back position. Then use that knowledge to move your pelvis/ lower back into neutral position when standing. Strengthening and stretching are important, but do not change posture or lifting habits, and so, do not cure back pain or posture problems. Often the pain was not from needing more strength or flexibility anyway. Use this new Dr. Jolie Bookspan method of using your brain and voluntary healthy movement habits to stop the source of pain. I have redesigned back exercises to be used to retrain you how you hold your body all the time. Doing back exercise is not like getting a shot of penicillin or going to confession. It does not fix bad habits the rest of the time. For example, lying down for pelvic tilts, then standing up and letting your back flop into any old bad posture, not keeping the proper tilt. Back exercise is supposed to retrain your thinking and habits *all the time* not merely something to "do 10 times." Strengthening has no effect on posture if you dont apply the strength the rest of the day to control joint angles for all activities. Use the introductory exercises, explained in the full ab article to retrain lower spine positioning during how you walk and go about your day. If you only use abdominal exercises as reps and sets of an"exercise," that is missing the point. More exercises to retrain abs for daily life and back pain rehab are in the book, The Ab Revolution No More Crunches, No More Back Pain. Also come try my Ab Revolution classes. Tight hamstrings are commonly thought to contribute to back pain. Even though that is not so, the irony is that many hamstring stretches are done in ways that bend forward, putting degenerative forces on the discs. Leaning over at the waist, both standing and sitting, for toe-touches does stretch your back and hamstrings, and may feel good, but is not good for discs. This is true even for yoga stretches where you bend over forward sitting or standing touch toes. Most people know not to bend over like that to pick things up or sit like that at your desk. It doesn't magically become good for you by calling it a stretch. Notice both your feet. Make sure your feet are both facing straight forward, not turned out, even a small amount. Lift one leg, knee straight. Make sure the foot you are standing on is still facing straight forward, not turned out, even a small amount. If it is turned, then either hop to straighten it, or put your other foot down, adjust, and figure how to lift one leg without twisting the other foot. This will be healthy training for walking, running and other movement. Lift to any height that gives stretch in the hamstring itself. Notice now tempting it is to use bad habits of bending forward, rounding your back, and other slouches that reduce the real stretch - on the hamstrings. Remember, stand upright so that you get the stretch for the hamstrings. Notice that standing without holding on or propping up your foot helps you practice balance. Hold your leg up with your hands if that helps you get more height until you strengthen enough. Make sure you don't round your shoulders or learn forward to reach your leg. Learning and practicing to stand straight is one of the purposes and benefits of doing this hamstring stretch in a functional way. Notice that you use standing on one leg and lifting the other to various heights in real life, from kicking and dancing, to stepping up heights, and others. I have other more functional hamstring stretches for you. I did studies that found no relation between hamstring flexibility and lower back pain - click to see why. Many people hurt from excessive forward bending. Then add many exercises with more forward bending - toe touches, knee to chest, most Pilates exercises, and crunches. Often these exercises are incorrectly prescribed for back and neck pain. They contribute to the original problem of over rounding and bad posture. Stop crunches. Use my ab techniques to get good exercise without needing the kind of flexion that is hard on discs. See my page on Abdominal muscles. More about Discs on the page for Fixing Discs and Sciatica. Here is my summary on bad exercises. Click the class page for my ab classes, back classes, and yoga classes that teach healthful movement. Unhealthy body movements or ongoing bad movement habits that ordinarily would only strain or pull a muscle or make it ache, sometimes result in spasm - painful muscle contraction that will not let go on its own. Spasm can also result if you routinely hold muscles tightly, or hold a rigid posture. Exact muscle chemistry change that allow back spasm in healthy people is not known - by anyone. According to the Association of Ringside Physicians, there are reports that certain dietary supplements such as creatine might increase risk of muscle cramps. Increasingly, people take large doses of various supplements. It is known that spasm and muscle cramps are not caused by lack of bananas - As my friend, sports medicine doc Tony Islas says: "It's not Hypo-Banana-emia." Direct Release. Back spasm can often be quickly relieved with specific brief stretches that directly lengthen specific muscle(s) in line with how they are shortened in spasm. Unfortunately spasm is often treated with long unnecessary courses of drugs, repeated 'adjustments' or other treatments, and fad food myths. The spasm may return between treatments, from the same bad habit(s) that caused it in the first place. Or a stretch that should be used only on the rare occasions needed to take out a lumbar spasm is mistaken for something to do daily - like forward bending stretches, which when done all the time cause their own kind of back pain (explained above and in the Disc Pain article). Yoga Triangles and twists are more examples. When used for a brief stretch - meaning two to three seconds at most - and not forced too far, can give a nice range of motion, give a brief healthy spongy movement to vertebral discs. If a spasm is down a specific side area, then a brief 2-4 second Triangle (simple side bend, no yoga classes needed) or specific direct gentle twist if specifically lengthening a spasm shortened in line with the twist, could release it - used as a one or two-time application. Random lists of yoga stretches may or may not lengthen the area needed. When triangle and twist poses are regularly done and maintained static for the long periods of time held in many classes, they put sheer force on the discs (a large component to herniation) and restrict circulation. Regular long side bends, forward bending, twists, and triangles are not needed or healthy. Standing with too much inward curve in the lower back, for example, keeps lumbar muscles in a shortened length, not their needed resting or functioning length. They may become too tight and stiff to be comfortable. A forward bend often feels good when it lengthens a shortened area, such as a lumbar spine chronically shortened from standing in a bad posture of swayback (hyperlordosis). 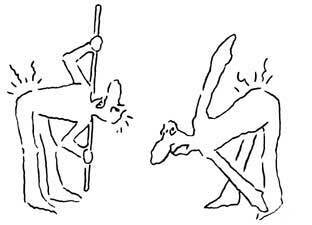 Forward bends become erroneously accepted as a cure, when not standing with swayback (the too large inward curve) would be the actual cure, and the forward bends a poor and unhealthy antidote. For an acute spasm, a lengthening bend can release it, if done right. If you continually go back to bad habits that make pain return, and claim you have to do yoga or other stretches every day to fix it, then your yoga or treatments are not fixing the causes. It may even be one of the causes. See the Yoga Page for more. For more on why hamstring flexibility is not related to back pain, or required to relieve it, see the Hamstring page. A lower back stretch that is functional and feels great, and also can lengthen a shortened tightened lower back is ordinary good bending using the squat, explained above in sections 2 and 3. A full squat with both heels down on the floor, done right, can be a good and healthy lower back stretch. 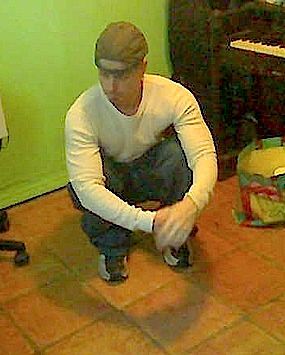 Student and regular success story contributor Robert Davis, demonstrates full squat with both heels flat on the floor, body fairly upright, in the photo above right. He also made us a video demonstrating using a simple half and full squat for picking up things around the house - to view Cardiovascular Cleanup, click the Functional Fitness as a Lifestyle page. Drugs. Several specific agents can let a contracted muscle release, such as a few drinks, a hot bath (not at the same time as the drinks) or a one-day course (two at most) of a relaxing agent. Muscle relaxers are not ever intended for long or extended use. Muscle relaxers can create dependence, withdrawal, and rebound, causing a cascade of increasing problems. Muscle relaxers are even prescribed when spasm is not present, making unnecessary medication that can harm, instead of identifying and stopping the cause of the pain. Many of these drugs are not limited to muscle but general system depressant. A terrible miscalculation occurs when people who are put on various kinds of muscle relaxers and related drugs that depress body systems get reduced bowel and other functions due to sluggishness directly related to the drugs. Some surgeons use the serious sign of "reduced bowel or bladder" for people who had an otherwise not dangerous disc herniation, and put them into back surgery. Foam rollers, tennis balls, and assorted overpriced devices are over-sold as cures. Sometimes people manage to randomly press the right place with them which accidentally lengthens, but what is needed is direct lengthening of the specific fibers shortened from spasm. The devices mostly serve to make money for the seller. For general use, they may not do anything physiological or for health. If you like them just to feel good in general, you don't need any invented sham reason to enjoy using them. Don't pay for hyped products. Make your own. Surgery Tragedy. Spasm can hurt terribly and limit ability to function. When people who could have benefited quickly from direct stretch or brief limited relaxing agents go for medical scans, sometimes a disc or other injury shows on scans that may not be the entire, or any, source of the pain. Surgery is often unnecessarily performed. The person wakes (on narcotics) thanking the doctor when the pain seems gone (for the moment) because the spasm, the main cause of the pain, was relaxed by the anesthetic. They may have increasing problems from the unnecessary surgery as time passes. Often, the anesthetic was what relieved the spasm, not the surgery. A tragic, painful, and expensive error. Food cures. No one, no scientist, knows actual cause and chemistry why muscles sometimes tighten so much and do not want to let go. 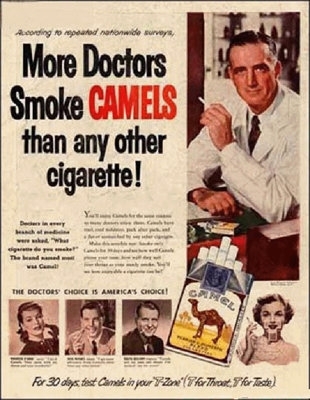 Lack of knowledge brings huge marketing offenses of sham cures of various pills and foods. It seems known that cause is not for lack of bananas or most other foods. Sometimes spasm goes away by itself, leaving whatever unrelated thing the person did or ate that day to become the next crazy claim for cure. Muscle "Balance" So many false beliefs perpetuate using vague phrases like "muscle imbalance" and that muscles "pulling" on your various parts cause "knots. Muscles pulling on your parts is how you move - normally and daily. Muscles on one side of the part have to pull harder than muscles on the other, or you would not be able to move at all. More on this in #7 below. For upper back spasm - under, between, and around the scapula (shoulder blades), one common cause is the bad habit of leaning the upper body backwards when standing. The same leaning back is sometimes associated with spasm in the front muscles just below the breast. This is more common when the person who leans the upper body backwards as a bad posture, rounds the upper body forward to compensate, resulting in a habitually shortened area right there that can go into spasm. My article on Neutral Spine shows how to prevent the upper body lean back (I named it Thoracic Lean) and stop this kind of upper body pain. A second cause of upper back spasm is squeezing the shoulder blades together deliberately because of bad advice about posture. Squeezing shoulder blades together as a habit more often causes a pinching pain and tightened muscles. Fixing upper body positioning is often more a matter of "unrounding" the upper spine (straightening), not pulling the shoulders back (and definitely not pinching shoulder blades together). See the Neck and Upper Body Pain Fix Article on how to restore healthy upper back muscle length and position so no squeezing or pressing downward is necessary. In short, back spasm release can be like a simple leg cramp release - a simple brief direct stretch in line with the specific shortened fibers. It can be tricky when different muscles clench at once in different directions. Then you must determine the direct lengthening that briefly gets them at once. Check back - this section on back spasm is in progress. 7. Myths of "Muscle Balance" and "Imbalance"
Much is repeated about "muscle balance" (or imbalance) but what does that mean? The often repeated myth is that one (or some) muscles pull more than others (like a tug of war) creating bad posture, or pulling, or other effect, however one muscle pulling more than another is how you move at all, how you are able to carefully aim a pitch or make it faster or slower, and control any large or fine movement. Muscle "imbalance" doesn't cause pain or herniated your discs. You constantly change pulling to move as wanted. Slouching and unhealthy positioning is rarely caused by muscles tighter on one area compared to another pulling you into bad position. Obvious exceptions are Tetanus or Cerebral Palsy. Even with dystonia or palsy, you need to control the muscles all the more. A well person who is slouching due to gravity, or tight, or uncoordinated isn't an imbalance of how hard muscles pull, but how you are able to control the amount of pulling, which grows with practice and is "use or lose" without exercise, like most other things. Having "tighter" muscles here and there isn't "imbalance," and sometimes tightness doesn't cause anything bad, even helps hold you in position without "rattling" too loosely. If you have to strain so much that it is painful to stand up comfortably straight, then use the stretches and healthy movement skills in my articles and books. Don't get sucked in by myths of fancy terms like "muscle imbalance" - you can control how you stand sit and move. There is more on this topic in my books. Pain When Your X-Ray is Normal. You may be in great pain from simple damaging mechanics. Your X-rays and scans are normal. You may be told nothing is wrong, or to give up favorite activities. Your pain persists from bad postural habits. This is no mystery. Change the bad habits to change the pain. Other times, scans show some minor problem like arthritis, herniated disc, or degenerating structures. Like car tires that are mid-life, but perfectly good, some wear may show on exam  but this is unrelated to performance or pain. Pain is falsely ascribed to the arthritis. Patients feel doomed, and are often told to give up activities. Pain (even the anomaly itself) may mostly result from poor mechanics. This is no mystery. Change the bad habits to change the pain. Sometimes, scans show some major problem, and major surgery is performed to correct it. When the original problem was from the bad positioning, often pain persists or returns because you never corrected the mechanics that caused it. The defect itself may return from uncorrected mechanics. Surgery can be avoided. Fix the source of the problem and the results of the problem can heal, usually without surgery. An extremely common scenario is someone who goes to the doctor with a little pain from the usual poor lifting and movement mechanics. They are prescribed foot orthotics, which a rigid molds mistakenly believed to "hold" the foot in proper position. However, consider this - they are molded sitting or lying down, not when the person is standing where they need it and when foot position changes. OR the orthotic is "custom shaped to the person's foot" which was in the wrong position to begin with. Often the orthotics are rigid and hard, which would cause pain in any case. The person get new pain in the leg, hip, which can increase to numbness, then they are told to further reduce activity and pay for PT or give up and live with pain. Common prescription and non-prescription medicines cause much back pain. The pain is not a rare effect as previously thought. Are you on medicines for lowering cholesterol? Sleeping medicines? For stomach acid? Drugs for depression and anxiety? Irritable bowel drugs, stomach acid drugs (a large contributor to osteoporosis and thinning bones, too) drugs to concentrate, to help wake up, to calm you, for allergies. Increasingly, drugs are found to make more pain as side effect, even drugs you are taking for pain. Trying to stop them causes rebound and withdrawal pain - good for drug companies to keep you on them, but bad for you and your health. More about this is on the Nutrition page. Stretches and exercises do not fix this kind of pain. In a worsening cycle, side effects are "treated" with yet more drugs with effects that lessen and degrade your health. That is not "side effects" and that is not health care. Many of these drugs are not needed. Some, like stomach acid drugs, are associated with rebound, and increased symptoms. A top health priority is to stop the need for these drugs so that you can lessen, then stop the need to take them. If you are in pain, so don't exercise, then get cholesterol and other health problems from not moving, can't sleep, then take cholesterol and sleeping medicines that cause dependence and more pain, use the healthy principles in my free summary articles and all my books so that you can move again, and be healthfully tired at the end of the day and sleep well at night. Not exercise is good medicine. Healthy exercise as healthy medicine will stop the pain and need for medicines that cause more problems. When you reach for anti-inflammatory medicines and pills (even foods) remember that most back pain from bad habits is not inflammatory in nature, and may be why all those pills aren't working. Change the bad habits that are the cause. There are foods that promote inflammation - dairy, meat, refined sugar, white flour. Even though most back pain is not inflammatory in nature, for those who load on inflammatory foods, and are sensitive to them, it might contribute. Eat anti-inflammatory foods - leafy green vegetables, flaxseed, cherries, grape skins, blueberries, spices like ginger and turmeric - not in addition to the same junk, but instead of the junk, for better overall health. Unhealthful fad diets are increasingly recognized for joint and muscle pain effects, specifically Atkins and other low carbohydrate diets that restrict fruit rather than junk sugar. Low carbohydrate diets reduce water in your muscles - water weight loss - making muscles susceptible to pain, weakness, cramping, and other health troubles. People will stick to these diets no matter how unhealthy; they'd rather lose weight through a fad diet than through healthier ways . More on all these topics is in the books. Much is known about why back surgery is usually not needed. Until I can collect and put all those articles here on this page, below are some links. It should let you see some of my articles about back surgery. It includes knee surgery outcome articles, and retains some of the original photos, movies, and comments, but links in those articles to my other Healthline articles will not work. Healthline replaced them with their own. Remember that medicine and allied medical fields have a checkered history of prescribing things that may seem to "work" at first, but are not healthy. Practitioners are not usually scientists; they often can only repeat what they were told by people who sell pills and surgeries. Count how many times you bend and stoop and reach downward for things each day. Imagine the accumulative pain to your back by bending wrong that many times each day. Lift and bend for anything using a healthy good squat or lunge (different foot positions for how you need to reach different things), not by bending over. My Academy student Nahy Milad Bassil demonstrates changing bad bending to good bending. Notice bent forward and hunching positioning and exercises in fitness magazines. Then notice your own habits. First thing in the morning, don't sit on the bed. Instead of sitting and rounding your back first thing, turn over and lie face down. Prop gently on elbows, but not so high that it strains, pinches, or hurts anywhere. Don't do this if it hurts. It should not hurt to simply lie straight. It should feel good and help you straighten out first thing. Get out of bed without sitting. Don't hold rigid "posture." Healthy movement is dynamic. Stopping back pain does not mean never moving the spine, and holding it in some posture. Healthy motion is crucial for health. Stand and carry things without rounding your upper back forward or leaning the upper body backward (exaggerating lumbar curve to the back or side). More on swayback in the Abs article and the Healthy Lifting and Carrying article. When sitting, it is not true that you must "keep feet on floor" or keep flat thighs - parallel to the ground. That is often repeated, but it does not change injurious mechanics, and is not needed. Focus on the main issue not the trivia. Learn more about this in the no-charge Sitting Healthy article on this web site. Learn to restore healthy upper back muscle resting length using the no-charge Fix Upper Back and Neck Pain article on this web site. Dont tighten your muscles to move or exercise. Gluteal and ab tightening is a pop fitness fad, not healthy medicine or exercise. TIghtening impedes movement and makes you feel tight and uncomfortable. You don't tighten your throat to sing. You don't tighten your arm to scratch your nose. You don't tighten your legs to run (or shouldn't). Learn to move your torso into healthy positioning without tightening your abdominal or gluteal muscles, or any muscles. Walk, run, and jump lightly. This doesn't mean to walk on tiptoe; your body and cells needs motion and impact and impact for health and growth. However, banging down without any shock absorbing action by your own muscles can jolt your joints, especially if your positioning and mechanics are not good. Easy Back Saver reminders for commuting, sitting, exercising and other activities- click for Backsavers. Henry Louis Mencken said, "Any man who afflicts the human race with ideas must be prepared to see them misunderstood" Even so, please don't change my work back into what you know. This is different and works differently than the pop fads that have become ingrained in fitness and health. To paraphrase Bertrand Russell, "An untrained man's report of what a knowledgeable man says is never accurate because he unconsciously translates what he hears into something he can understand." My work is primary source, and often not what we learned in school and the gym. Remember, that is good. How Long Does It Take To Fix Back Pain? If it hurts you ARE doing it wrong. Stop and assess. Check what you are doing compared to what is presented above. None of the above are "exercises" to "do" - they are retraining drills to learn to stop doing the things that injure. Are you doing bad exercises from other sources? It is common to do a few movements from my work, but continue or add common injurious exercises, stretches, and posture rules, that slow recovery and re-injure. Are you tightening or clenching any muscles? Tight muscles can hurt and impede healthy movement. Are you overcompensating? Are you making new bad movement habits that seem opposite of original unhealthy movement, thinking that will "undo" or fix? Are you going back to bad movement habits during the day? Check my free article on bad exercises, this one on bad stretches, and this one showing better health and understanding what abdominal muscles really do to fix back pain. Is something else causing the pain, such as infection, shingles, growths, Lyme disease, allergies, Sickle Cell condition, too tight clothes or equipment, a bed that is too hard, side effects of medicines and supplements you take, or other non-musculoskeletal conditions? It takes years to hurt a disc and practice injurious muscle habits, but only days to start repair once you no longer are injuring yourself. Make sure there is not something else contributing to your pain. It is is almost always quick and easy to start getting your life back and start feeling better right now. Don't wait. Here is a charming e-mail sent to me from Joan J. 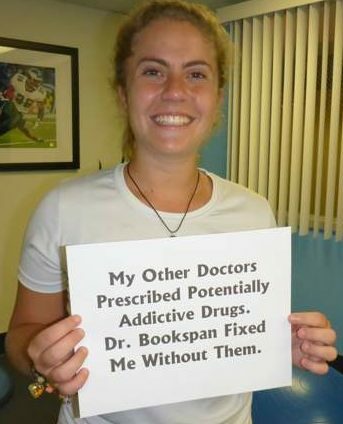 "In desperation I turned to the internet and finally found Dr Bookspan. She explained how to fix my horrible pain and she didn't charge me a cent for her article! I was so grateful that I send her a donation. Later I sent another one, when my back reminded me that I stopped standing right. 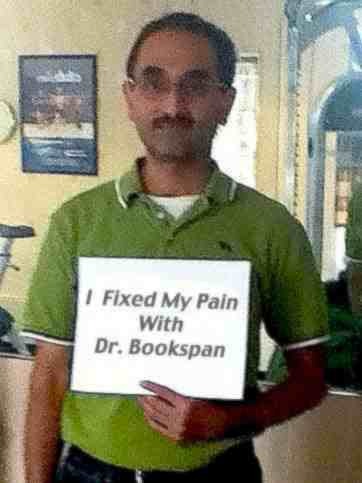 I straighten the way Dr. Bookspan showed me and the pain goes away immediately. The funny thing is my back has learned its lesson so well I don't need to send her a Thank You donation anymore! Hmmm. That doesn't seem right." Joan runs a sanctuary for abandoned animals where she rescues, treats, and finds homes for them. I told her she could put her next donation toward their care where it will help animals and people be happy together. To send your own Rhymes and Rhythms for Remembering Health, see the Projects Page. To keep this article a quick and easy summary, much is left out. The books tell more. Back pain is not a mysterious "condition." People spend their day sitting, working, walking, and driving in terrible positioning, hunching over the computer, lifting and bending wrong all day, walking heavily, standing and walking with too much inward curve in the lower spine, slouching all day, then exercise in ways that strain and pressure discs and muscles and deliberately train injurious movement habits like overarching and bad bending. People do yoga and Pilates that forcibly pushes discs outward, and reinforces flexed (bent forward) hip and forward bending. 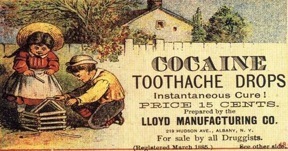 They take anti-inflammatory medications for mechanical pain that is not inflammatory in nature, try remedies that do not address the cause of the problem, do physical therapy in ways that exacerbates the original problem, give up favorite activities, have surgery, then return to previous injurious habits, and everyone is astonished that they "tried everything and nothing seemed to work." It is like eating butter and sugar all day, then waving your hands in the air for 5 minutes and saying "I don't understands why I don't lose weight, I do my exercises." Use healthy positioning to stop the cause of disc damage and muscle pain and they can repair themselves. Then, no need for pills or surgery or adjustments. Does my work mean you never do any flexion? Of course not - that is misunderstanding the concepts. The idea is to notice if you spend most of your day that way, then use flexion exercises on top of that. Then it is no mystery why you hurt. Understand, don't memorize, blanket and arbitrary rules. Dont memorize rules and postures or think that an exercise or kind of exercise will fix back pain, - which is more likely from a number of all your bad movement habits. Understand what healthful movement needs and then move accordingly for all you want to do. Use your muscles to reposition for daily life - to get built in exercise. That is exercise as a lifestyle. Please don't combine conventional injurious stretches and exercises then come back to me and say my work isn't fixing that. Exercise as a lifestyle does not mean going to a gym a few times a week. It means how you move all day in real life. Get exercise as a lifestyle through all-day healthy movement, so your back can mend, and you can do more than before. People love to go to a gym to exercise their abs, then go back to hyperlordosis for daily life. If they maintained neutral spine instead of swayback, they would not have the pain and would get healthy abdominal use all the time. Exercise may not fix most back pain, but it is good for you in general. It is crucial for your health and recovery. Not all exercise is healthy, just like not all food and medicine - there is junk food and unhealthy medicine. Use my work to understand the concepts so that you can tell what is healthy movement for yourself. Then apply it to your life - happy, healthy, active. If your lower back pain is from too much inward curve to the lower spine (swayback, also called hyperlordosis), then stopping that slouching posture and changing to neutral spine will feel better right away. Often people "tuck the hip" too much, or tighten, or push their hip forward instead of changing the tilt, then claim neutral spine is wrong or does not work. The Abs Article tells more. Use a side view mirror and learn to feel and tell how you are moving your body and how to change a swayback to a neutral spine. If your pain is not from a too large inward curve (swayback) then check for other unhealthful movement patterns you may habitually do, and change those, simply, without straining or forcing. Please do not e-mail me saying you are "doing the exercises 10 times" and want me to tell you how to fix pain from bad positioning and bad bending. Doing an exercise then going back to unhealthful body usage is missing the point. Stop bad bending and unhealthful positioning and habits. Stop the causes and the pain will stop. This free article summarizes. My books tell more. How is your body positioning right now? The point of exercise and therapy is missed if you dont learn to consciously use healthful positioning the rest of the day for standing, sitting, bending, having fun, and all you do. How long do you want to hurt? Stop injurious positioning today. Don't wait. 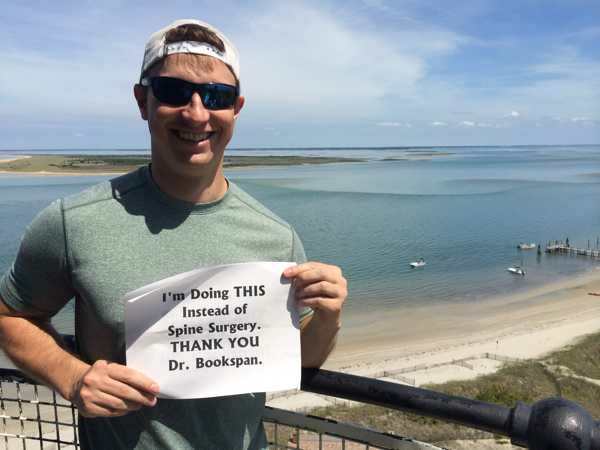 Matt R, pictured above at the top of Cape Lookout Lighthouse, wrote shortly after working with me to fix a badly injured disc in May 2015, "Here's some information about the Lighthouse to add to the story of what I'm doing instead of the back surgery the doctors said was required. Thanks to you I don't need the surgery. I thought the warning from the Lighthouse web page was kind of fun... ''Warning: The climb to the top is strenuous. It may be hot, humid, noisy, and dim inside the lighthouse. Climbing the 207 steps to the gallery is roughly equal to climbing a 12-story building.'" Matt has been hiking, climbing, and skiing since then, pain free and mobile. If you enjoyed this article and want to help this web site, throw a few dollars in the Donate box - secure and safe - through PayPal. Now that your back is better you will save hundreds, maybe thousands of dollars not needing unhealthful pills, surgery, expensive products, and treatments. You can take a vacation, give to the poor, and still click DONATE. Thank you ! Help this site without donating anything. Click any links from my books to Amazon to get anything else, whether it's my books or not. Amazon will send this site a small percentage of purchases (not clicks) - anonymously. Get song downloads, groceries, health and medical equipment, home stuff, movies, whatever. Your name is never given to me. Larger purchases send more, so get your next computer or playground this way, too. Thank you for helping this web site by shopping for things you get anyway. Proceeds go running this site, class scholarships, free world health programs through my Academy, donations to world need causes. Use the links for next time you shop, too. Have fun. Learn In Person. Top training. Fix your pain. Group CLASSES and Private Appointments for yourself or your private groups. Fix Your Pain With Fitness as a Lifestyle (Functional Fitness). Not reps of exercises or training "plans" or devices, but how you move all day - making your daily real life into your own mental, emotional and physical playground of strength mobility and health for knees and the rest of you. TWITTER Tweet nice notes and success stories how you are better, which is my big reward. Prizes for the best ones. Follow me on Twitter @TheFitnessFixer for health updates, quick & short. Sharing buttons at the bottom of this page. Mental & Emotional Training - A page of my short articles for stronger emotional health. Bookspan Basics - Quick training drills for yourself and your groups. Set up healthy movement training programs for schools and groups, eventually as part of my nationwide program. Fun T-Shirts, Mugs, Mouse Pads, More. T-shirts for teachers and slouchers, mugs that remind healthy neck for drinking, Learn and promote functional health with UNcommon sense gifts from the Academy (on CafePress). Top level book for all athletes to train thinking, spirit, and top performance. Healthy Martial Arts is the top of the line book (of my books) for exercises and athletes. Sun Tzu's "The Art of War" is the classic strategy manual in business and power. "Healthy Martial Arts" is the strategy manual for your life. For everyone, not only martial artists, who want to move, live, eat, and be happy Direct from Amazon - Healthy Martial Arts. More descriptions on the BOOKS page. Have fun! This article is copyright and here to benefit the world. Information, drawings, and photos are © protected copyright. 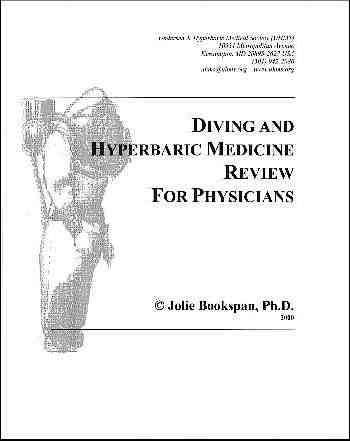 To cite this article or any parts, list author Dr. Jolie Bookspan, and link to this site DrBookspan.com at the top and bottom of your reprinting. A suggestion to get my books is also nice. No Derivative Works License means no changes to content, wording or links. Drawings of Backman!™ copyright © Dr. Jolie Bookspan from the book Stretching Smarter Stretching Healthier, Fix Your Own Pain, and others. More LEGAL, Waivers and Reprint Info.